The Chinese probe Chang'e 4 today changed orbit in preparation for what could be the first moon landing in history on the dark side of the Moon, reported the National Space Administration of China (ANEC). The ANEC, quoted by the state news agency Xinhua, explained that the Chang'e 4 entered the planned elliptical orbit at 08:55 local time (00:55 GMT) today, with the perilunium - the point of most approach to the Moon with the present orbit - about 15 kilometers and the apolunio - the maximum distance - to about 100. From the entrance of the Chang'e 4 in the lunar orbit, the past day 12, the control center of Beijing has cut the orbit of the probe in two occasions. Also, the Chinese space agency has checked the communications between the probe and the Queqiao link satellite, the image taking instruments and the range detectors of the probe, with a view to the preparation of the landing. The center will choose the "right time" to complete the moon landing, which Beijing anticipates for the beginning of January. According to the agency, the mission will perform tasks of low frequency radio astronomical observation, terrain and relief analysis, detection of mineral composition and shallow lunar surface structure and measurement of neutron and neutral atom radiation to study the environment on the hidden side of the Moon. Last August, China revealed images of the exploration vehicle with which it hopes to examine it, something that no country has yet achieved. The probe, which includes a module and an explorer vehicle, was launched on March 8 by a Long March 3B rocket from the Xichang Satellite Launch Center in Sichuan province in the southwest. Pioneering space programs such as the Soviet or the American have already achieved more than half a century ago photographing the hidden side but they have never landed there, despite the fact that in 1962 a US unmanned mission tried unsuccessfully. 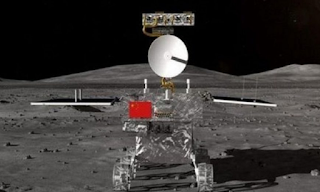 Last May China took the first step for this new mission with the launch of a satellite to facilitate communications between the lunar hidden face and the control centers on Earth. The Chang'e program (named after a goddess who, according to Chinese legends, lives on the Moon) began with the launch of a first orbital probe in 2007, and since then four devices have been brought to Earth's satellite. plus. The final objective of the program is a manned mission to the Moon in the long term, although the date has not been set for it and some experts place it around the year 2036.